It’s not feeling very springlike this morning. It dropped well below freezing last night and today dawned frozen like a rock. Cyndie is gone to visit her parents in Florida, so Delilah and I are in charge of caring for the chickens and Pequenita. Since Delilah is no help with either, I am pretty much on my own there. The paddocks have become a lonesome place to pass. There are still a few piles of horse “apples” yet to be collected out in the farther reaches, but that will wait for some magical moment when it isn’t frozen solid, or so wet and muddy it’s impossible to navigate. A neighbor posted a request for used T-post fence posts on our local online site, and we have some to spare, so Delilah and I spent time in the barn yesterday sorting out the ones missing anchor plates from those that have them, as well as culling a few that lack the quality of straightness. Now they are laid out all over the floor in piles of five, something that we would not do if the horses were still here. It is freeing, but weird. I also took advantage of having my music playing while I worked. We chose to avoid exposing our horses to the sounds of recorded music, so it was a novelty to be working in the barn with tunes on. 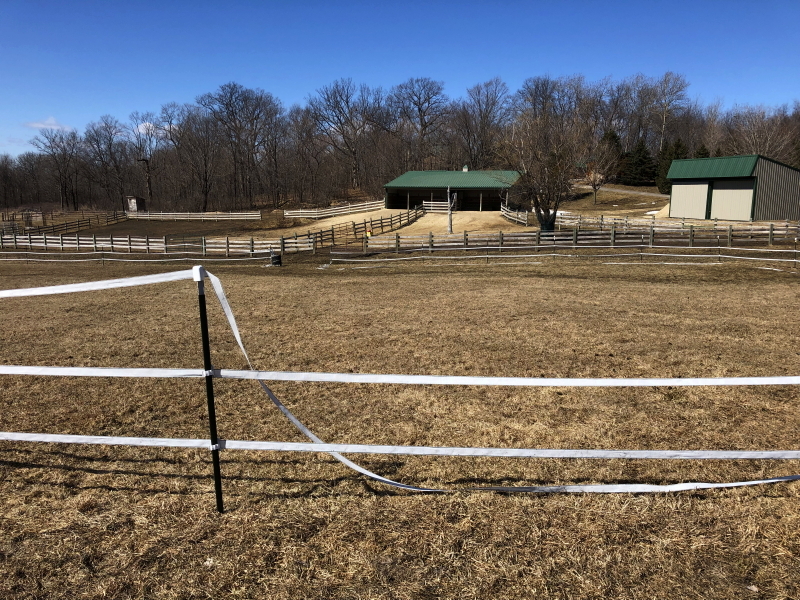 While we were tending to fence posts, I decided to begin dismantling the border that defined our arena space in a corner of the hay-field. Most of the posts are still frozen in the ground, but the webbing could come down. It was beautifully sunny, but also cold and windy. Much of the work had me pulling my hands out of my gloves and soon my fingers grew so cold I started to lose dexterity. Also, the plastic insulators weren’t very agreeable to being flexed open, so that didn’t help my cold hands any. 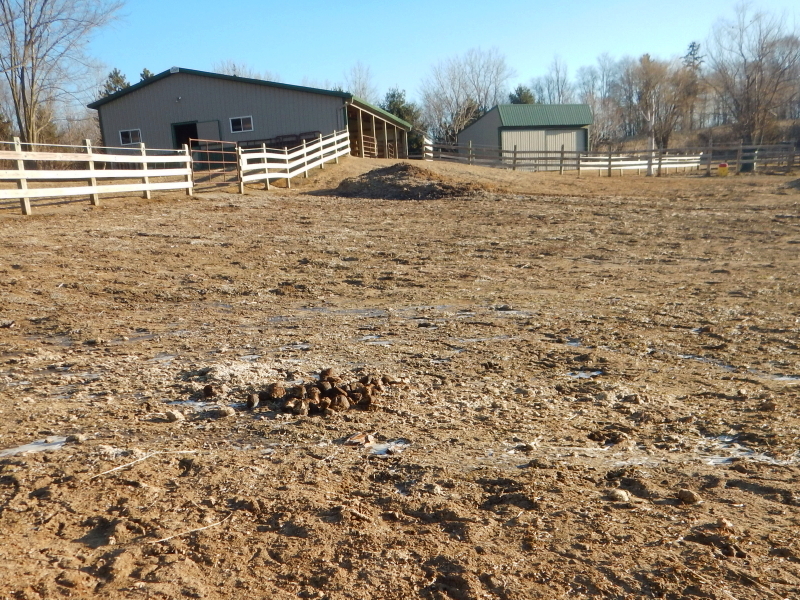 This morning, Delilah and I walked through the back pasture and reached the round pen, with its sloppy sand currently frozen, preserving the footprints of chickens. Only chickens. It served to prod my lonesomeness for our horses. This is so sad to see and think of a horseless property. This must have been such a difficult decision for you. I’m only just following the journey so I haven’t read up completely on all the details but I get a basic idea. It wasn’t easy, but it has helped that the result has been very affirming of our decision. We will never lose the lessons we have learned from horses, and look forward to future equine opportunities in our lives. It sounds like you are moving in the right directions. Besides, if you REALLY miss horses there is a surplus of them waiting to be loved? You two amazing friends are in our thoughts and prayers. Getting caught up on the past few days of your journey has me smiling, tearing up and thanking God for you both. Love you always, our sweet amazing friends! Aww. You’re the best, Ruthie! Thanks.